Backed by a team of our experienced professionals, we are engaged in offering a wide array of Steel Tube Fitting Elbow to our respected customers. We are offering a wide range of CI Saddle. These are fabricated with perfection using the latest machines. Mainly used in drilling of tube well to connect and handle of the G. I. or plastic pipes properly. - Pressure Rating: 6 kg/ sq. Cm, 10 Kg/sq. Cm., 16 kg/ sq. cm. 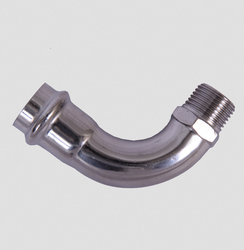 We specialize in manufacturing a wide range of fittings like tube elbow that finds application in various industries like cement, paper, petrochemical industries etc. These are available in various shapes and sizes to suit the industry's requirements. A choice of elbow connections and ports. All intersurgical port caps are retainable for safety, they are fixed to the port connectors to ensure that they cannot be misplaced in use.